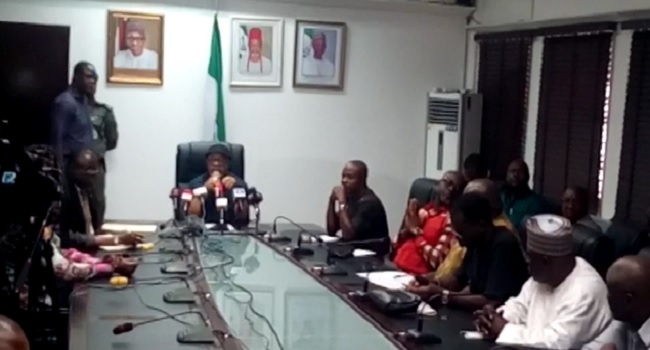 The Labour Minister, Chris Ngige, is about to meet with the leadership of the United Labour Congress (NLC) over the ongoing strike. Members of Nigeria Union of Petroleum and Natural Gas Workers (NUPENG), an acclaimed affiliate union of ULC had on Tuesday turned down an invitation from the ministry for a conciliation meeting, saying that NUPENG did not declare strike, but ULC did and will only honour an invitation to discuss with the ULC. The Minister had in an earlier briefing described ULC as an illegal trade union. But the Minister is now making a U-turn as he has recongised ULC as a Labour Union whose registration is in motion. The United Labour Congress of Nigeria (ULC) on Monday commenced a nationwide strike. The union is downing their tools over the failure of the government to register the union, failure to address Academic Staff Union of Universities (ASUU) issues, deplorable state of Nigerian roads, minimum wage increase, among other demands. The affiliated unions of ULC include (NUPENG), Electricity Workers, Nigerian Union of Mine Workers, National Union of Banks, Insurance and Financial Institutions employees, Association of Nigerian aviation professionals, among others.